One of the single largest challenges facing any organization is assuring the deliberate and effective allocation of resources to those endeavors that deliver the greatest strategic advantage, and then generating meaningful performance results. Should be easy, right? Well, anyone who has ever tried this knows, it isn’t easy at all. Because of just how difficult it is to achieve this desired optimal allocation result, many organizations find themselves in a situation where they are either underutilized or underfunded. Often, they find themselves vacillating between these two states, on a roller coaster ride, rarely achieving the right balance. The problem when this happens is, regardless of which side of the supply-demand equation your resource imbalance may lie on, the organization is likely to be under-performing to its potential and it is even more likely to fall behind on attaining its goals and objectives. As the modern-day proverb says, “Failure to plan, is planning to fail”. Portfolio managers know this, and work feverishly for their organizations to help them see around the next corner. Many approaches to resource capacity planning become heavy on resources themselves to accomplish and then return an answer that can often lack the precision desired. Like any form of forecasting, it is subject to unknowns and uncertainties. It is worth noting how challenging this has been historically. Predictions regarding the cost and duration of the world-famous Sydney Opera House project ran over estimates by 1500% and 10 years. We sometimes forget that it is difficult to actually “predict” when we are asked to do the predicting. Compounding this problem is that across the organization, stakeholders are faced with many barriers to informed decision making. Here are a few examples. Several projects that have recently been completed or are currently in flight have become very uncertain and look to be falling short of their forecasted performance expectations. 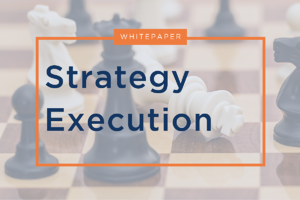 Pressure mounts to mitigate the risks, and attention turns to a full-on press against the short-term fix with a focus on improving execution and results. Resources are rushed in to respond with little consideration of what else they might be doing if they weren’t drawn into these difficult, and possibly bad, projects. The resources are becoming overloaded and increasingly spread thin, and so performance suffers across more projects. In the scramble to make things better, the risks and gaps in performance get worse! As the situation devolves, budgets may get cut, and the opportunities in the queue with a chance of turning the tide, are neglected or shelved, and the cycle repeats, deepens, and becomes increasingly difficult to pull out of. Organizational frustrated grows and support weakens as the efforts don’t meet the projections. The problems grow and the pace becomes frenetic. The organization becomes trapped to trying to dig its way out of a hole, rather than climbing. This scenario may sound all too familiar, and responses like the following may feel like the only way to respond quickly enough. “What is the current percentage allocation splits in the budget? Would you prefer $80 today, or $100 in one year? – what do you choose? Would you prefer $80 in 10 years, or $100 in 11 years? – what do you choose? How can your organization avoid these traps? 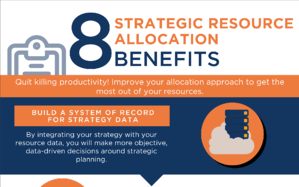 Intelligently making resource allocation choices may seem like a daunting task. It is a complex problem, but also one that is easy to over-complicate. When beginning to assess their choices, organizations may balk while thinking of the many things they need to take into consideration. “What is the right mix of projects that will achieve their goals? How will this mix balance off so many dimensions between short- and long-term, risk and reward, cost and benefit, legacy and emerging opportunities?” among many others. Then once chosen, will the projects need to be continuously evaluated and analyzed in the search for ways to continuously improve the portfolio? How will we do that? The ability of the organization to adapt to new information and new opportunities is a key to success. Speculative choices made yesterday don’t consistently reflect the realities of today and so they need to be revisited periodically. 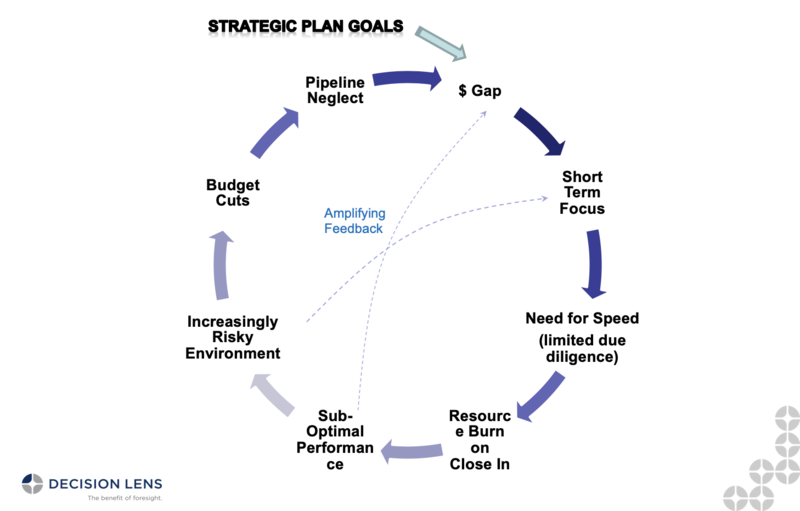 Being able to nimbly scenario-plan to identify how new proposals compare against existing opportunities in the portfolio and stack up against the organization’s resource capacity is the basis for continuous improvement that is achievable only by making recommendations to decision makers and stakeholders at each level of the organization. These capabilities outlined previously, stand in stark contrast to some familiar methods of allocation, where lengthy annual reviews followed by “locking and loading” the plan and executing ruthlessly (often without good feedback), or simply basing investment splits on historical levels, approaches which can leave the vision, mission and purpose of the organization subject to the forces of momentum and chance. This knowledge of all the things that could, or maybe should, be considered can paralyze an organization from beginning to make great resource allocation choices because they are falling prey to the old aphorism “the perfect is the enemy of the good enough”. In 1969 economist Harold Demsetz coined the term the “Nirvana Fallacy” [ref], which basically stated that people will often set up a false choice between an actual achievable realistic possibility and an unrealistic idealized alternative, and not act while awaiting the latter. This is the basis for many an excuse for not establishing a process to manage resource allocation on a continuous and impactful way. – Yes, it is, you have more than you know! – Yes, you are, if not now, when? In a study by McKinsey it was found that organizations who could more rapidly rotate their capital allocation amongst different operating units and objectives were able to generate a 120% greater return than those that could not. Financial investors can take advantage of volatility to capture option value. The same opportunity appears to be true when it comes to capital and resource allocation within project portfolios. Those that can quickly plan, allocate, evaluate, reassess and reallocate can adapt to the unforeseen changes that inevitably come from social, technological, environmental, economic and political forces that are sure to shape the context in which they make their choices. So, there is no time like the present, to begin your portfolio management journey, and perhaps speed, rather than precision, is of the essence. Think about an individual’s investment portfolio. The framework for financial portfolio management is the basis for the ideas used in project portfolio management. Essentially in both cases, we are investing resources, in the way of costs, to generate value. 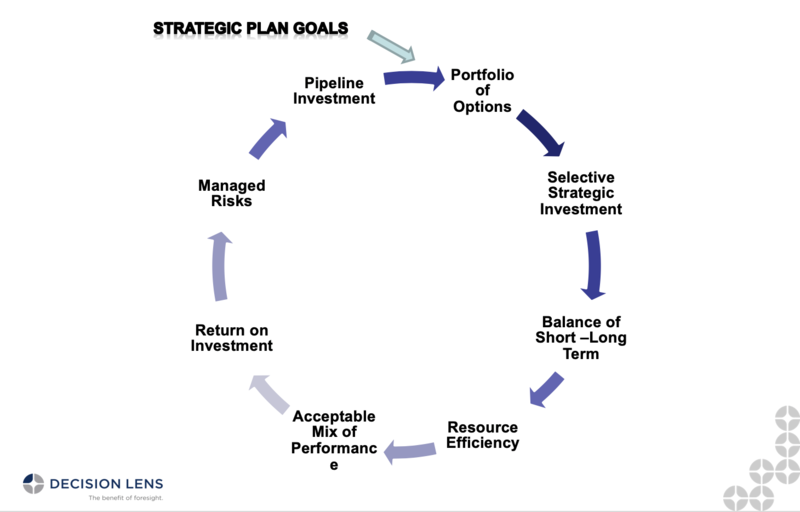 To get a beneficial return, at an acceptable level of risks, across a variety of different categories of investment. With financial usecases, dollars are invested (costs) usually looking for a return in dollars (value) in a mix of different asset classes with different performance profiles (stocks, bonds, mutual funds, real estate, etc. – risks and balance). In project portfolio management, we invest resources (dollars, people/talent, production capacity, etc.) in projects or programs to get a return (capabilities, customer benefit that we may exchange for money, new services, etc.) across a variety of asset classes or dimensions (short-long term, geographic, R&D, operations, etc.). 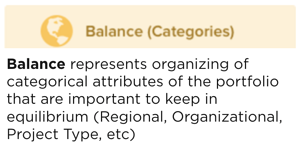 This basic framework of, Value generated for the Costs invested, at an acceptable Risk level, balanced across Categories of interest, is a foundational framework for the problem. When moving resources to impact portfolio performance, it is often favorable to look at performance at the level of the asset classes that can be invested in. For instance, are individual chosen stocks, mutual funds or bonds showing the best return? We would move our money at that macro level first, probably with limited insight into the specific composition of the mutual or bond fund. Looking at your project portfolio from these high-level perspectives can make the complex and dynamic process of resource planning in the project portfolio, simpler and more actionable. From this simple tiered analysis, we can approximate, and understand, many things about the portfolio at a high level; the expected or directional value/cost, value/cost/category, the comparative resource demand by category, the average risk/category, the value and cost at risk… these indicators can guide meaningful discussions and provide insights as resource estimates are refined and sharpened. This quick characterization of the portfolio can be a very effective at uncovering critical resource planning questions and insights. Making a high level directional analysis can often reveal where it is most important to make more refined and detailed estimates. When making portfolio resource allocation decisions it is often more important, initially, to understand the directional relative differences between projects and how they fit together than it is to strive for precise data points (which, whenever forward-looking is a forecast, uncertain and likely precisely wrong but often directionally correct). What is important to the portfolio allocation process is the ability to continually asses if projects are trending positively and negatively on the key attributes, and to progressively elaborate the resolution of estimates to sharpen the focus as more is learned. This is an important issue to understand, and one that often keeps organizations from beginning to move forward on their analysis of portfolio resource allocation choices. There is no need to whiplash the organization into trying to achieve this higher resolution view of your portfolio on day one. One of the most challenging aspects of portfolio management is that you need to move forward to know where you are. Maybe this is counterintuitive, but when it is understood and enabled to use imperfect information and refine it as more becomes known to analyze the evolution of projects and the trends in value and cost of opportunities it can make the once stalled organization, nimble, adaptive and responsive to the emerging challenges that once set them spinning. By moving to measures and estimates that can be reevaluated in short enough time cycles that support the speed of decision making, organizations can begin to truly fight, rather than flight or freeze in the face of disruptions and challenges. Think about this simple point. If your analysis takes longer to complete than the amount of time you have to make choices and adapt and pursue a new opportunity to create value, then it is not a helpful analysis. If the analysis is so mired in heavy data collection and false precision that makes it slow rather than responsive, it may be providing a false sense of security. It may feel comforting to have so much detail in front of you on day one, but it may also be misleading, while appearing thorough and precise in appearance. The key question is, is it allowing you to move resources at the speed of new information and adapt to change? Using Decision Lens resource planning solution, portfolios can be easily brought together and analyzed to inform your most challenging resource planning questions. Decision Lens can take your measures or help you quickly estimate the value, cost, balance and risk of your projects. You may have categories of investment within your portfolio, or have multiple portfolios that need to be aggregated in to a big picture view. By providing you a means to bring your data together through our import, integration and easy to use interface, we can map your data to the Decision Lens framework. Decision Lens can help you keep your data updated, and bring together a portfolio of portfolios. 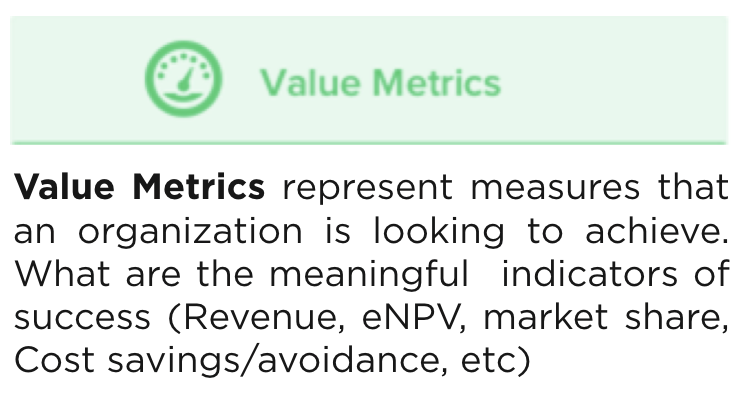 Depending on where you are on the maturity curve, you can use quick estimates to establish the difference between projects across the spectrum of maturity from a simple set of basic measures to multiple measures of value, pulling from many sources of funding, across many time periods in your planning horizon. You can start with a simple score card and progress to replacing it with a key performance indicators, or metrics as you decide which variables best describe your portfolio and defines your resource allocation trade-offs and opportunities. The only certain information in the resource planning process may be that which is sitting in the 20/20 rearview mirror. Preserving the data about how projects were forecasted to cost and perform and reassessing them as they progress (on the dimensions of value, cost, balance and risk) can provide important context for making the new choices under uncertainty as you are looking forward into the future. Using Decision Lens suite of resource allocation tools, your organization will be able to take knowledge of past results and performance along with estimates of current and future projects, and nimbly navigate the possible paths forward. Using this robust set of scenario planning capabilities your organization will be able to compare and contrast the different resource allocation plans that highlight recommendations to pivot and move your organization toward more value, lowered costs, less risk, and a better balance that is adapted in response to your current environment and its emerging or most disruptive challenges. Decision Lens can help you quickly communicate why options are being considered and what the driving forces are that make them attractive, along with what the impacts and risks of the resource trade-offs are that could be considered. 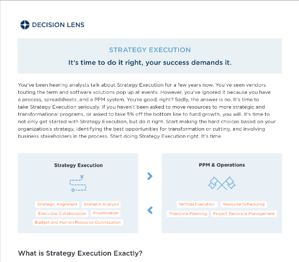 Decision Lens provides a solution with a set of tools that allows you to start simply and refine your view with better and better data and learning over time to drive continuous improvement of your resource allocation process. The ability to make choices knowing where you’ve been, where you are, and where you might go, with algorithms and analytics that find options, and highlight differences can lead to insights and opportunities that will enable meaningful resource allocation decisions that will change your organizations performance, and move you toward your goals and objectives. Have a Goal You're Trying to Reach?